Fourteen-year-old Parkside High School student RJ Batts may soon become a household name as his invention, Tip Tough gains popularity. Tip Tough is a stainless steel, restaurant quality gadget that covers your fingers and allows you to slice your food without worrying about cutting your fingers. Batts said he got the inspiration back in 2013 to create it from his father, a chef. “He came home with a really bad cut one day and he had to get stitches that day and I decided that needed to stop and he couldn’t get anymore cuts like that,” Batts said. So Batts came up with a few sketches and eventually came up with the concept for Tough Tip. However the idea was nothing more than a dream and sketch until Salisbury Area Chamber of Commerce’s Young Entrepreneurs Academy program came along last year. “It helped me through how to learn, how to make a business and how to form it because we had no idea how to continue from that sketch,” Batt said. Batts completed the six month inaugural program and graduated in May of 2015. Since then he has already sold over a 100 Tough Tips through both local stores and online sales. Batts said he was even recently contacted by As Seen On TV, who expressed interest in his product. As for the YEA program Batts said it was hard work, but worth it. Although 14 years old may seem young to start your own business, program director for YEA,Sophia Smecker said it’s just the right age to start chasing your dreams. “These students they have the drive, they have the motivation, they have the passion now so why not harness that energy while you’re in middle or high school,” Smecker said. The YEA program accepts kids grades sixth through 12. Applications to get in are due September 30 to the chamber of commerce and can be faxed, emailed, mailed or hand delivered. As part of the program, Smecker said students will get to meet over 80 businesses and get to go on various field trips meet the owners of the businesses. Participants will also get to work with a web designer to create their own web page for their product. Finally they’ll all participate pitch presentation and ask for seed funding at the end of the program. Ultimately Smecker said the chamber of commerce will only take 24 students into the program. However if year one of the program was any indication of success, all students admitted for year two should be set to succeed. Smecker said all students in year one received some level of funding for their projects. As for Batts, he encourages all who might be interested to apply, because at the end of the day, he said being your own boss is pretty cool. 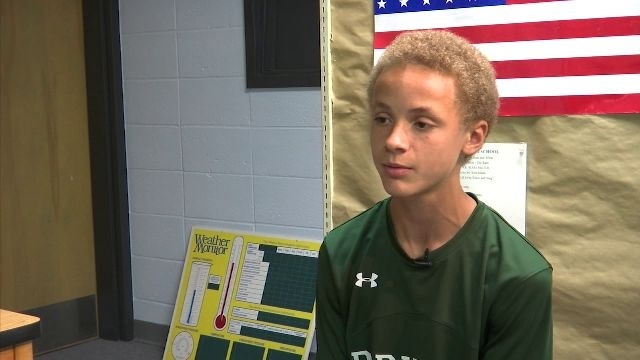 “It’s a lot to juggle but it’s also awesome – just to go up to friends and be like yeah I have my own business at 14, actually I was just in the cafeteria and they were like you have your own business and I was like yeah,” Batts said. For more information on the YEA program, just click here. If you’d like to see the Batt’s web page for Tip Tough, click here.